Fat. It’s in our diet. It tastes good and makes us feel satisfied after a meal. And it contributes to the waistline. We need some of it for good health, especially brain health. However, there is more than one kind of fat, and we consider it common knowledge that there is good fat and bad fat. But the research also shows that the question of fat is not easily answered. Experts typically consider saturated fat the bad fat. “Saturated” in chemical terms refers to molecular bonds between atoms. A saturated compound has only single bonds in its chemical structure, and hydrogen atoms readily bind themselves to those single bonds. So a saturated fat is “saturated” with hydrogen atoms. Saturated fats are found in meat, some plant oils, dairy products, and processed foods. You will also find them in snack foods. So what is wrong with saturated fats? Researchers frankly aren’t certain. Consuming saturated fats may boost your LDL or “bad” cholesterol. However, research also shows that the kind of LDL it boosts comes in larger particles, which don’t appear to increase your risk of heart disease (unlike earlier studies which simply looked at the increase in LDL without drawing a distinction between types of LDL cholesterol). In fact, some studies suggest that it may be simply the fact of losing a few pounds that lowers the bad forms of LDL cholesterol, rather than reducing fat consumption alone. Some studies also suggest the type of food you eat, while containing saturated fat, may carry other substances that contribute more to disease than fat itself. 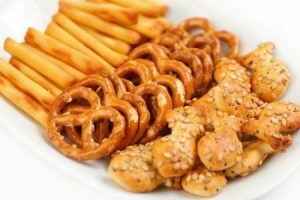 In other words, the presence of saturated fat isn’t the culprit; the culprit may be other things that happen to be included in those fatty foods. Of course, more long-term studies are needed. One study suggests that while dairy products contain saturated fats, consuming these products actually lowers your risk of heart disease. Of course, many people are intolerant to dairy, so a food intolerance test can help with decisions about food choices. Chemically, unsaturated fats have multiple chemical bonds, and therefore are not “saturated” with hydrogen atoms. Unsaturated fats tend to be liquid at room temperature. Foods that contain these fats include nuts, fish such as tuna or salmon, and certain cooking oils such as olive or avocado oil. These are all good for you, according to the research, but this may be more a question of having other healthy components. The fat itself may not necessarily be the issue. Snack foods are often deep fried and contain bad fat. So the jury is not yet in on whether fats alone are good or bad for you… but we don’t generally eat fats alone. In my opinion, reducing your sugar consumption is a priority for good health. Then look at consumption of packaged foods – those ones with the chemical stew on the label. Next, focus on choosing good fats over bad fat. That generally means eliminating vegetable-based oils and those foods that are deep-fried in them. Don’t forget, however, that there is one thing we know for certain: fat carries calories, and the more calories you put into your system, the more weight you will gain. Our Hong Kong doctors can help you look at your lifestyle, current weight, target weight, age, health issues and even genetics to design an enjoyable list of food choices that keeps you at a healthy weight. The most important things you can do to reduce weight are: reduce your calorie intake, and increase your calorie output. So, eat less, or eat foods that contain fewer calories. And build exercise into your day. Even a half-hour walk each day can work wonders. Join a gym or start bicycling. And of course, manage what you eat. Sure, getting bad fat out of your diet can help, but it’s your overall dietary choices that get healthy results.